In an age where every other veteran artist seems to tackle the "Great American Songbook", Blue illustrates that Diana Ross met that challenge long before... and won. 1972: At the age of 28, the woman who helped define the "Motown Sound" in the 1960s faced a challenge: "Diana Ross as Billie Holiday." No two names could have been more dissimilar. Yet Berry Gordy, President of Motown Records and eager to be a player in the Hollywood game, created a star vehicle for Motown's reigning queen to depict the ill-fated jazz vocalist in a major motion picture. Jazz purists scoffed, film critics sharpened their pencils, and Ross fans wondered how she would jump from "Love Child" to "God Bless the Child". Entitled Lady Sings the Blues, the film marked one of the first occasions that a popular recording artist with no previous screen credits portrayed a musical legend. Ross committed herself completely to the role and proved to be a natural actress, not mimicking Holiday but embodying the poisonous web of fame, addiction, and oppression that brought on the late singer's death in 1959. By any measure of success, Lady Sings the Blues was a triumph: a smash at the box office, a #1 soundtrack album on the Billboard Pop Charts, and Ross snagged an Academy Award nomination. 2006: On the occasion of the film's 34th anniversary, Motown/Universal has unearthed an album that, presumably, was meant to build upon the success of Lady Sings the Blues. Recorded in 1972, the same year of the film's release, Blue features Diana Ross further traversing the terrain of jazz standards. Singing the "The Great American Songbook" was not new to Ross: The Supremes Sing Rodgers & Hart (1967) dented the Top 20 of the Billboard Pop Charts some five years earlier and The Supremes often incorporated standards into their concert appearances. The difference on Blue is technique. Produced by famed arranger Gil Askey, Blue captured Ross dipping into the emotional wellspring employed for her acting debut. Highlights are numerous and reflect two sides of the Diana Ross coin: bittersweet interpretations of "What a Diff'rence a Day Makes" and "Little Girl Blue" keep company with exuberant renditions of "I Loves Ya Porgy" and "Had You Been Around". Three songs from Lady Sings the Blues reappear with slightly different arrangements, though a couple ("You’ve Changed" and "My Man") are best heard on the soundtrack. The most Holiday-inflected cut on Blue is the Toots Camarata/Sidney Russell-penned "No More". Listening to Ross' honeyed voice winding around the twists and turns of an aching melody, one forgets that this is the same woman who declared "Stop! In the Name of Love". A mature sense of nuance permeates this performance and is worth the purchase of the CD. Harry Weigner and Andrew Skurow of Universal merit special mention for securing the four bonus tracks added to the album's originally-proposed 12-track release. 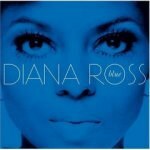 To hear Diana Ross breathe life into Duke's "Solitude" or add a unique nonchalance to "T'Ain't Nobody's Bizness If I Do" is to hear a singer respect the jazz vocalist tradition while making the songs her own. For reasons unknown, Blue was shelved, though a couple of tracks snuck onto subsequent Ross releases. What would have been Diana Ross' sixth solo album is finally dusted off from the vaults, adorned with a classic Harry Langdon image of Ross staring directly, nakedly, at us, the listeners. In an age where every other veteran artist seems to tackle the "Great American Songbook," Blue illustrates that Diana Ross met that challenge long before... and won.